Chicago-based specialty travel company Vacations By Rail kicks is adding 29 new rail tours across North America to its collection of train vacations for 2013. New tours range from 3 to 21 days and visit popular destinations and take in must-experience annual events. Other new programs feature locally-hosted and escorted US vacations along the west coast, tours to national parks, and exciting rail-cruise vacations. Further west, connect the Canadian Rockies and Seattle with new Coastal Passage packages. Select from two: Western Explorer & Coastal Passage and Canadian Rockies & Coastal Passage. 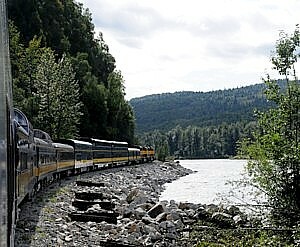 Both include travel aboard Rocky Mountaineer trains in GoldLeaf service from Seattle to Vancouver and from Vancouver into the Canadian Rockies. All of Vacations By Rail’s new train tours include outstanding rail experiences, hotel accommodations, select meals and comprehensive sightseeing. Detailed itineraries for new tours as well as Vacations By Rail’s complete product line can be found at www.vacationsbyrail.com. To book a Vacations By Rail train vacation, contact a rail specialist at 1-877-929-7245. Chicago-based specialty travel company Vacations By Rail kicks off the New Year with the addition of 20 new rail tours to its collection of worldwide train vacations. New tours range from 8 to 16 days and visit popular destinations and annual events throughout the United States, Canada and Europe. The new Fall Colors and Scenic Trains tour places travelers in the heart of New England’s spectacular autumn foliage, providing a firsthand look at the brilliant colors in Massachusetts, Maine, New Hampshire, Vermont and Connecticut by coach, charming lake cruises and the region’s most scenic trains including the Maine Eastern Railroad, Conway Scenic Railroad and Cape Cod Central Railroad. 2012 marks the 100th anniversary of the Calgary Stampede, the “Greatest Outdoor Show on Earth.” Beginning and ending in Chicago, the new Calgary Stampede and the Canadian Rockies tour spends three days at this annual event in addition to touring throughout the Canadian Rockies and travel aboard Amtrak’s legendary Empire Builder train. Head to Spring Training and root for the home team with Arizona Spring Training by Rail. Combine Arizona’s most popular sights and tickets to one of the most popular springtime activities with roundtrip rail travel aboard the Southwest Chief. Celebrate the July 4 holiday with a rail-river cruise combination tour brimming with Americana. American Legends includes travel aboard a private rail car from Chicago to St. Louis, the chance to see the nation’s largest fireworks display and a leisurely 6-night steamboat cruise aboard the American Queen from St. Louis to Louisville. Iconic America can also be discovered in new tours highlighting the music that made America famous; the scenic rail adventures of the Colorado Rockies; and, new tours to some of North America’s most popular National Parks. New rail tours include outstanding train experiences, hotel accommodations, select meals and comprehensive sightseeing among other package inclusions. Detailed itineraries for new tours as well as Vacations By Rail’s complete product line can be found at www.vacationsbyrail.com. Vacations By Rail is intorducing three rail journeys aboard India’s newest luxury train, the Maharajas’ Express, to its global product line. New itineraries take travelers along two popular routes—New Delhi to Mumbai (and reverse) and a circle journey of northeastern India beginning and ending in New Delhi. The 8-day Princely India and Royal India itineraries showcase India’s colorful culture—and include an opportunity to meet royalty. Highlights of these two rail journeys include visits to the country’s most popular areas from Vadodar and Udaipur to the royal state of Rajasthan and its popular cities of Jodhpur and Jaipur as well as a visit to the acclaimed Ranthambore National Park to catch a glimpse of the elusive tigers. The 7-day Classical India tour highlights India’s rich history with visits to the royal city of Gwalior, Varanasi and the sacred River Ganges, the temples of Khajuraho, and the imperial splendor of Lucknow. All itineraries include a visit to Agra and the renowned Taj Mahal. Built in 2010, the Maharajas’ Express is India’s newest luxury train featuring 23 well-appointed carriages including two dining rooms serving Indian and continental cuisines, a lounge car and bar car. The train travels approximately 2,000 kilometers through the duration of each trip. Each rail journey includes accommodations aboard the train in deluxe cabins with en suite bathrooms, all meals, house wine, beer, spirits and soft beverages and all off-train excursions. Luxury rail journeys aboard the Maharajas’ Express start at $6,265 land-only per person based on double occupancy. Departures are available October 2011 through April 2012. To book your luxury rail journey aboard the Maharajas’ Express, contact a Vacations By Rail travel specialist at 877-929-7245. For detailed itineraries and additional information about the Maharajas’ Express or any of Vacations By Rail’s luxury rail vacations, visit www.vacationsbyrail.com. Vacations By Rail is a leading seller of rail travel and tours in North America and around the world. Travelers can choose from the largest selection of independent rail vacations, escorted rail tours, and luxury rail journeys around the world. 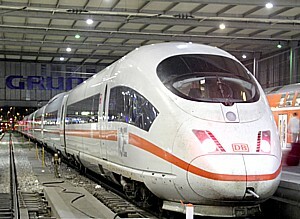 Vacations By Rail also provides virtually every European rail pass and ticket to meet customers’ European travel needs. For more information on Vacations By Rail and the company’s products, visit www.vacationsbyrail.com or call 877-929-7245. With Earth Day around the corner, the environment—and our role in protecting it—is top of mind as we’re reminded of our social responsibility be it in every day activities or in coordinating the annual family vacation. Travelers interested in planning an eco-friendly getaway need not look further than a train package from Vacations By Rail. The Chicago-based travel company specializes in train vacations to popular destinations throughout the world that decrease one’s carbon footprint and the impact of travel on the environment while offering a unique vacation experience. Within the United States, Vacations By Rail incorporates travel aboard some of Amtrak’s most iconic trains including the legendary California Zephyr, historic Empire Builder, and stunning Coast Starlight. According to the U.S. Department of Energy, domestic travel by train is 20% more efficient than air travel and 28% more efficient than travel by car on a per-passenger-mile basis. Similarly, train travel within Canada has been made even more environmentally-friendly with the use of greener locomotives along VIA Rail’s transcontinental rail routes as well as eco-friendly maintenance practices among other green innovations to reduce greenhouse gas emissions. Train travel is also more energy efficient, using less fuel per passenger mile than cars or airplanes. With the price of gasoline expected to reach unprecedented rates per gallon this summer, it is also an affordable mode of transportation for upcoming vacations. Handing over driving and navigation duties to the railroad, travelers can experience parts of the country accessible by no other means of transportation when riding the rails, enjoying a unique perspective of nature and its unspoiled beauty. Go green with Vacations By Rail. Select from hundreds of vacations that include historic rail routes, eco-friendly trains, breathtaking scenery, unique sightseeing, and National Parks. Visit www.vacationsbyrail.com or speak with a rail specialist at 877-929-7245. Vacations By Rail is the leading seller of rail travel and tours in North America and the trusted authority on rail vacations. Travelers can choose from the largest selection of independent rail vacations, escorted rail tours, and luxury rail journeys around the world. Vacations By Rail also provides virtually every European rail pass and ticket to meet customers’ European travel needs. For more information on Vacations By Rail and the company’s products, visit www.vacationsbyrail.com or call 877-929-7245. Vacations By Rail is one of the providers of new Rocky Mountaineer SilverLeaf rail service, available on select routes and vacation dates in 2011. To entice travelers to experience this new class of service, Vacations By Rail is offering customers a $50 per person savings when upgrading from RedLeaf to SilverLeaf service from April 1-30, 2011. Travelers in the SilverLeaf class of service enjoy panoramic views of Western Canada and the Canadian Rockies through oversized windows in a single-level dome coach, choice of entrees served at their seat, complimentary beverages including a morning toast and wine and beer at lunch, service and commentary from onboard attendants, and GoldLeaf-equivalent accommodations in Kamloops with luggage service. SilverLeaf service is available on select departure dates through October 2011 on all First Passage to the West rail vacations between Vancouver, British Columbia, and Banff, Alberta as well as two-day rail journeys along the same route. To book a Rocky Mountaineer rail vacation and save $50 when upgrading to SilverLeaf service, contact a Vacations By Rail travel specialist at 877-929-7245. For more information about Vacations By Rail’s train vacations aboard the all-daylight Rocky Mountaineer train, visit www.vacationsbyrail.com. Vacations By Rail is a leading seller of rail travel and tours in North America and an authority on rail vacations. Travelers can choose from the largest selection of independent rail vacations, escorted rail tours, and luxury rail journeys around the world. Vacations By Rail also provides virtually every European rail pass and ticket. For more information on Vacations By Rail and the company’s products, visit www.vacationsbyrail.com or call 877-929-7245.